MEBS offers specialized custom crating and export packing services at all 16 MEBS locations in the United States and overseas. MEBS crating expertise includes customized crates and over packs ranging from smaller, high-value items such as medical, laboratory and monitoring equipment, to oversized and break-bulk items, including such commodities as vehicle glass, generators, tracked vehicles and knocked-down river-crossing bridges. Our highly skilled crating personnel ensure that all items, large and small, are secured for international transport to remote locations worldwide. Cargo integrity is protected by utilizing best materials, proper load-weight balance techniques including safe-and-secure lift points, and the proper utilization of desiccant and vacuum packs for high-value, sensitive electronic equipment and components. 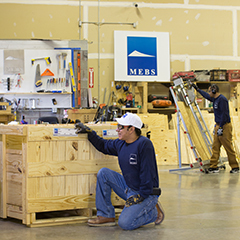 As a result of strict, international requirements on cargo imported in wooden crates, MEBS crating crews operate a company-owned wood shop within the MEBS US headquarters warehouse in Chantilly, VA. Additionally, a mobile crating crew is available for on-site packing and crating. MEBS is certified through the International Standards for Phytosanitary Measures No. 15 (ISPM 15). All MEBS packed crates are ISPM 15 certified and meet or exceed MIL-SPEC standards.